The NS7 Controller from Numark delivers high-resolution control so powerful, you&apos;ll wonder how you ever DJ&apos;d without it. The NS7 Controller is a dedicated controller for Serato™ ITCH. 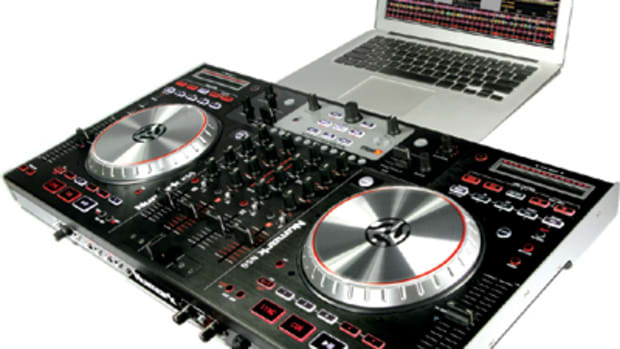 It ships with Serato ITCH and comes ready to control the DJ software of your choice, including Serato ITCH and Numark&apos;s CUE DJ software. Intro: This year Numark who is known for its industry-leading and proven technologies combined with its 30 years of maintaining the tradition of bringing us breakthrough products has finally made the official release of the highly anticipated NS7. 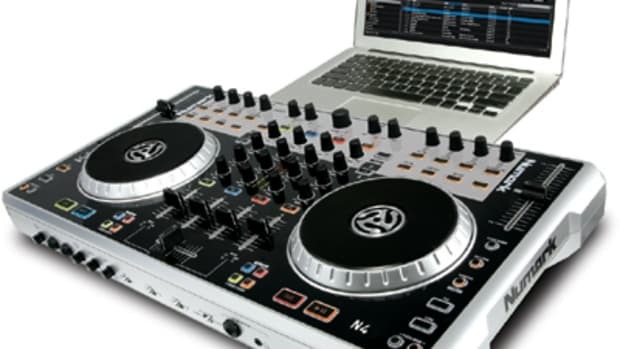 This system is so anticipated a waiting list has been established by Numark’s distributors as well as a pre-order system. After doing some research I found out that Serato had first discussed the possibilities of collaborating on a direct-drive motorized turntable controller a little over 3 years ago. With this said and done I had to see first hand what all the hype was really about, and do it first hand. In attempting to acquire the newly released NS7 it immediately proved to be a challenge. Shipments were extremely low and demand is high. In my search I managed to arrange with a local Guitar Center the notification of the first NS7 to enter the store. It turned out this was going to be the store’s display. After receiving notification and 1 hour of talking to the staff and managers I was able to make the purchase it and see what exactly all the hype was about. It was love at first sight… The black beauty with classy billet aluminum platters having a true vinyl surface that contained the feel that any turntableist is so familiar with glistened, through the light. “This thing is a work of art” It brings a boldly modern and classically well known look and feel meshed with a futuristic control, for any turntablelist all in a well planned, well thought, and successfully executed manner. Hardware: The unit has a good professional feel throughout the entire console, and seems to be constructed and fashioned from Black Anodized Brushed Aluminum within the platter area, 7 inch Machined and Polished Billet Platters with real slip mats, 45 Rpm record vinyl with polished aluminum adapters, a High Gloss Black Surface within the Mixer and Control areas and a matching Metallic Silver base and sides, all which make it too easy for anyone to forget even at first glance that this system is a MIDI controller. 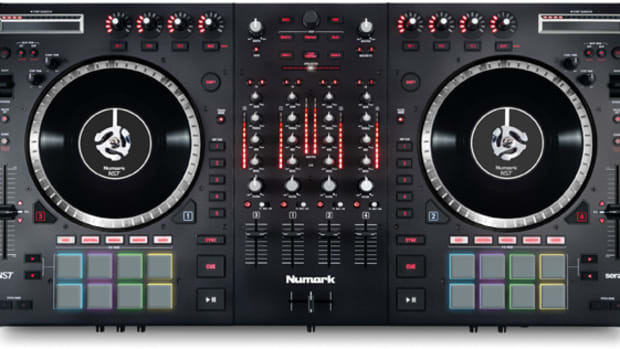 It also becomes evident immediately that Numark’s primary focus was to deliver a look and feel Vinyl DJs are familiar with combined with easy accessibly and complete control. This is notice in the fact all inputs are conveniently located on the control surface and the front of the unit (with the exception of the USB connection). Further more the NS7 features rubberized buttons, knobs, and levers for a better tactile feel, slight grip and response, at a closer look you will also notice that detail was given not to rubberize the head phone channel/master monitor cross fader, the independent platter volume faders or, the cross fader which all have a excellent high quality feel to them making it a desirable choice for professional and performing DJs. Software: After popping in the Serato Itch CD and following the instructions it also becomes immediately apparent that Serato and Numark both teamed up to make this incredibly super easy. Yes it’s true “it’s so easy even a cave man can do it”. The steps were like Plug in Power to the NS7, Pop the disc in, Follow the on screen instructions (just 2 or so steps which are connect your USB cable briefly disconnect and reconnect and you are ready to take over the world or any club one mix at a time in under merely a minute and a half. Which brings me to this next section: The Overview? After about 5 minutes and grinning from ear to ear you begin to realize just how precise and accurate the NS7 combined with Serato’s Itch really is, including its clarity. Numark is using a 24-bit, 44.1 kHz audio output on both the gold platted balanced XLRs as well as the Master and Booth RCA output connections. It also has a Headphone stereo ¼” and stereo 1/8” connection. Other features include five hot-cue-assign buttons on each deck which are conveniently located and are able to activate, delete and reprogram instantly to your delight and to your immediate need. These cue points are reflected as marker points within the software screen and are re-callable not only within the hardware but through the software simultaneously. I am uncertain if this was an unintentional feature. However, the vinyl records “slip” or slack on the platters can be further finely adjusted by loosening the allen spindle screw retaining the Polished Aluminum 45RPM adapters and adjusting the height or level, resulting in less or increased pressure between the record, slip mat and platter. I considered this to be a form of precision custom fine tuning offered as an additional measure to the two modes Motor Torque section switch located on the front of the NS7. By the way the another nice feature is the air cooling system introduced in the NS7 which cools the Platter motors housed in the all metal body if the unit. This proves to be a good preventative measure on the behalf of Numark. A good old school not left off was the Reverse Play function. This is activated with just a flip of a switch causing both your tack and motorized patters to reverse and is modernized with an added Bleep function activated when the switch is toggle the opposite direction. Additionally you have full individual control over the “Start” and “Stop” timing of each platter side through 2 individual knobs per side. Another feature is the “Motor off” switch, this will allow the platters to function as a pitch bend when activated and is reflected in the software all the way down to the decimal point and when “On” will allow you to perform real time scratching or control the surface as you would of any vinyl record. 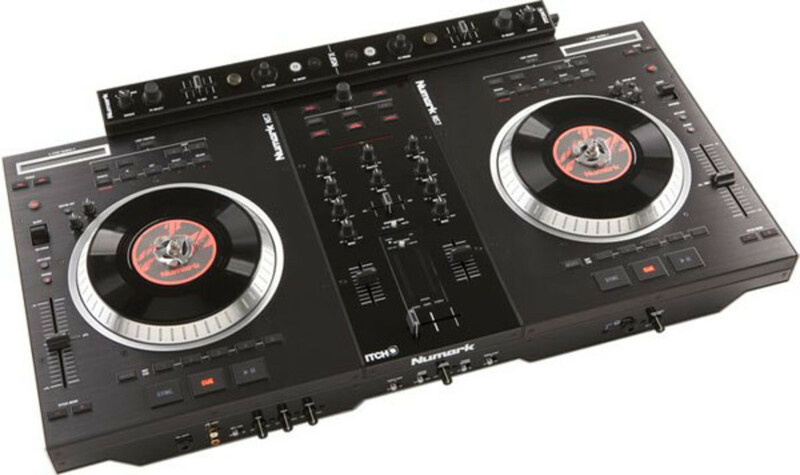 There is a Key lock function to both platter sides to ensure there are no unwanted evil party crashing Chipmunks present in your live mixes, There are smooth, stiff pitch sliders with the traditional - + pitch bend buttons along with a Zero-Point LED so you know when you are at the track’s original recorded pitch position. 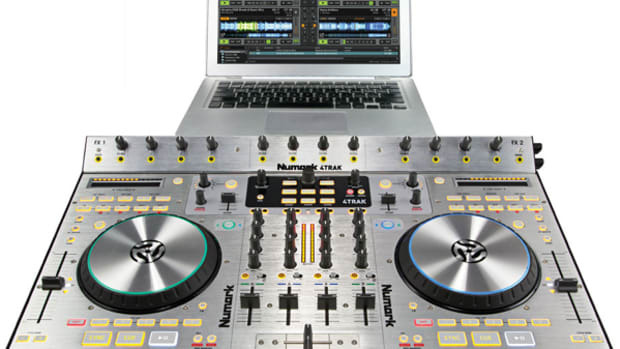 To bring out the creative remix DJ side of you Numark also added an extensive Serato-style loop section to each deck side for creative remixing, build ups, loops and more. Interestingly enough this feature has two modes: Automatic auto loop and Manual either of which you can use the automatic BPM analyzer to further assist in loop making thus creating smart loops of any measure. Aside from the loop control on/off there is a “½ x” and “2 x” which will split or half by any increment or double by any increment when selected as well as a shift section. Over all combined with the capability of any Vinyl Turn Table available in the market today and a modern CD deck there is a major twist! NO MORE LUGGING OF RECORDS or CDs around!!! All you need now is a laptop, and some digital audio stored on a drive and, a NS7 and you are off mixing hours if not days at a time. 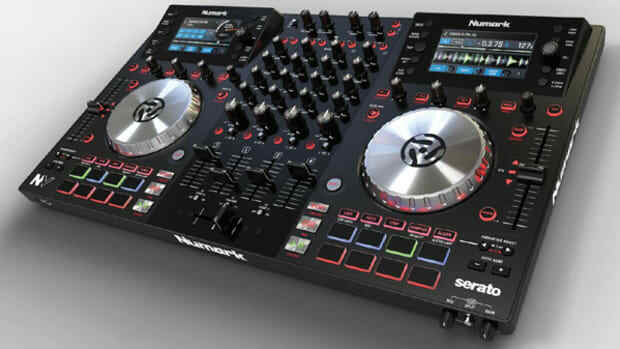 The Numark 4Trak is finally here! 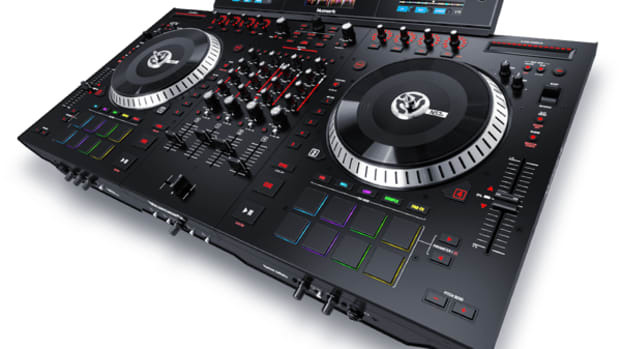 The 4Trak is the newest Traktor Professional Digital DJ Controller brought to us by Numark DJ Division. The 4Trak is like the very successful Numark NS6 controller, but instead of working with Serato Itch, users can now use the 4Trak with Traktor and enjoy a perfect one-to-one mapping of all the Traktor controls right at the DJ's fingertips. 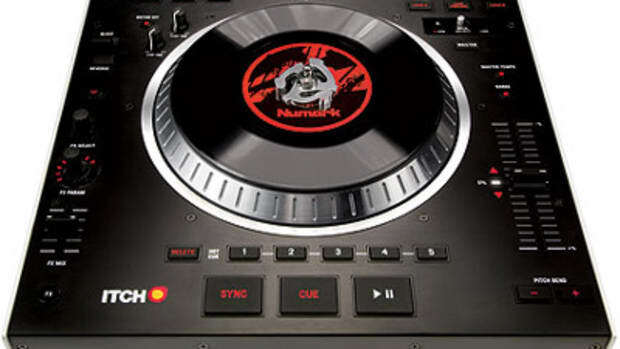 We have a Numark 4Trak in the Lab for a Full HD-Video review which will be ready in a week or so. In the meantime, you can check out the new introduction, overview, and mapping tutorial videos inside.